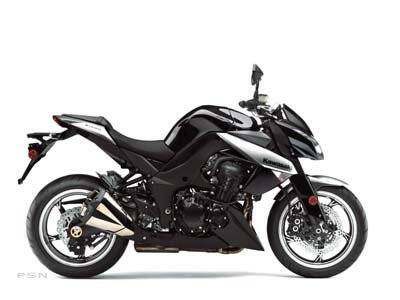 Kawasaki Z: Bringing you the world’s coolest streetbikes since 1973. With this latest in a long line of naked Kawasaki streetbikes, we threw out the old rules and started with a clean sheet, drawing upon more than 35 years of experience in giving the people what they want. If the new Z1000 knocks your eyeballs out, that’s exactly what we had in mind. Even more important, though, is the feeling this one provides every time you twist the throttle. As much as possible, welds were eliminated for simplicity and appearance. The frame beams and swingarm brackets are now single die-cast pieces. The frame’s 5-piece construction consists of steering stem, left and right main frames, and 2 cross pieces. The 2 main frame components have open C-shaped cross sections. Linkage characteristics are the same as those of a standard Uni-Trak rear suspension. Wheel movement versus shock stroke is the same ratio. The rear brake is a single piston, pin-slide caliper gripping a 250 mm petal disc. The caliper is mounted below the swingarm, and located by a torque rod. Thanks to the under-engine pre-chamber, silencer volume could be reduced. The silencers are also lighter. Overall exhaust system weight is about the same, but the new system offers much better mass centralization and contributes to a lower center of gravity. The exhaust system features a 4-into-2-pre-chamber-into-2 layout. Silencer end-caps maintain the quad-style image. With revised fuel tank design and the slim-type fuel pump, dead volume inside the tank is minimized; fuel capacity is 4.1 gal.